A depleted Old Leamingtonians side exited the Senior Vase after failing to make the most of their opportunities. The visitors, with several players missing and others playing out of position, dominated possession and created more scoring chances but a combination of bad luck and unforced errors proved their downfall. The home pack was heavier and more coordinated than their Old Leamingtonians counterparts and this was illustrated by two pushover tries, one in each half. With the wind at their backs in the first half OLs enjoyed the territorial advantage but again poor lineout ball brought many of the opportunities to a halt. With the first half coming to a close, a break by the Dunstablians number eight saw him collect a loose ball and run half the length of the pitch to score beneath the posts. Then, an audacious drop goal from the same player saw half-time reached with Old Leamingtonians trailing by 15 points. The visitors played much better against the strong wind than with it and had control of the game for long periods of the second half but were unable to breach the home defence. Late in the game, the heavier Dunstablians forwards again pushed the OLs pack back across the line to score a third try and give the scoreline a slightly lopsided look. Tomorrow sees Midlands Three West (South) leaders Ledbury visit The Crofts for a 2.15pm kick-off. Meanwhile, Old Leamingtonians Ladies suffered a narrow 17-10 defeat at home to Five Ways Old Edwardians in the Midlands Division One of the National Conference. Five Ways kicked off and Old Leamingtonians quickly set up camp in the opposition half. The pressure eventually told when outside-centre Shannon Lynch dived over despite the attentions of a tackler to score the opening try of the game, which went unconverted. Five Ways responded well and levelled the scores with a try under the posts. However, the conversion attempt was unsuccessful thanks to OLs’ forward Tash Faulkner charging down the kick. It was then Old Leamingtonians turn to go on the attack, and the whole team played their part in moving play into the Five Ways 22. New-girl Karis Dalziel eventually got the score, touching down out wide for a debut try. The kick was missed to leave Old Leams with a 10-5 advantage at the break. After the restart the wind picked up and unfortunately for Old Leams, so did their visitors. Five Ways spread the ball out to their winger who scored to drag their side level once again. Old Leamingtonians kept fighting and were unlucky when a clever kick from number ten Jamielee McCreadie was caught by the wind and trickled just over the dead-ball line. 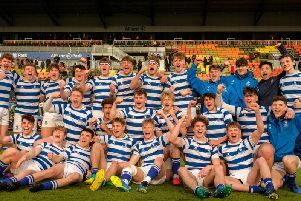 However, the home team just could not create a scoring opportunity and it was Five Ways who conjured up the match-winning try, this time on the other wing, with the subsequent conversion taking their lead out to a crucial seven points.